After installing and trying S5 (018 version), I imported a perfectly working S4 LMS file as a first step. This sequence has a both traditional Sequencer and Pixel Editor data / props. In S4, there are no problems - the preview has no errors, the song plays and the props light up in the preview window the way that they are supposed to. In S5, a great many of those same preview props are lost when I apply the same preview that is used in S4. Also - the dialog box that asks for me to initially assign a preview says I am using the "imported" preview found in the sequence... not right - it should allow me to specify the preview to use. I have attached images of what's going on. When the preview plays, all I get in the playback window is some scattered colored squares everywhere. Please help! Unfortunatly I think you have to redo your props for version 5. I had to, but for me it wasn't that big a deal, and it gave me the opprotunity to redo some that were iffy in S4. If you use an S$ preview in S5 you will get the colored dots. Thank you so much for helping, Bob! I guess I'll have to bite the bullet and re-input everything but my intensity data will still be lost (unavailable) and I would need to somehow copy it from my S4-built sequences and paste it in the correct rows. Can't see a way to do that because S4 and S5 can't co-exist on the same machine. Maybe create an additional virtual machine on the same PC? You would think that the migration to S5 would have considered migrating the previews as a first step. Anyone else encounter this? I had no issues bringing my preview over to S5. You can import old visualizer file. Thanks - it imported all the SE traditional stuff fine - just not the PE RGB props and data. 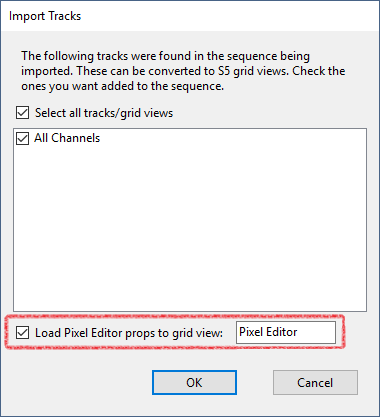 Note that when a sequence is upgraded to S5, the Pixel Editor effects get put into a separate grid view. I think the next beta version will fix the problem shown in the video. Please give it a try when it becomes available -- and let us know how it goes. Thanks for reporting the issue. Thank you, Matt - I think the S5 is going to be a great way to program our lights and thanks for putting it together. Of course, it's essential to get the import function to work correctly because OMG I can't do all that effects programming all over again!